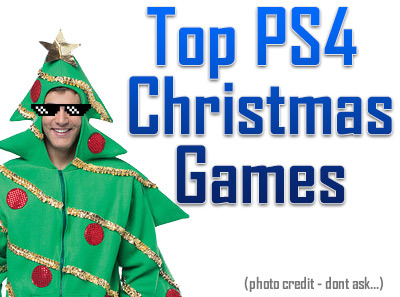 Christmas time is fast approaching, and the PlayStation 4 has recently exploded in the number of quality games to get. With so many games vying for a spot on your Christmas list, getting stuck with a dud will turn Christmas cheer into Christmas sneer. Here are the top 10 PlayStation 4 games to get this Christmas, letting you show potential gift givers the best PS4 stocking stuffers this holiday season. Horizon Zero Dawn signaled the revival of Guerilla Games as a developer and put them back on the map for gamers everywhere. Having done nothing but Killzone since the studio was formed over a decade ago, they decided to do something completely different. The result was an open world post-apocalyptic RPG starring a girl named Alloy who seeks answers behind her past, the fate of humanity, and much more. The tribal characters combine with the highly advanced robotic enemies for a game that looks and feels totally different than anything you've played. Not only this, but it's absolutely gorgeous as well on PS4 and in 4K on PS4 Pro. Every PS4 player needs to try this amazing game. Check out the trailer above! Wolfenstein: The New Order was one of my favorite PS4 games when it released, and the sequel is even better. This first-person shooter takes place in a Nazi-occupied America and you play as Willliam Joseph Blazkowicz. This epic story takes you across America as you fight to take back the United States from Nazi tyranny. With a deeply powerful and polished story, this shooter goes all in on the campaign and offers an incredible experience. The original MIddle Earth title showed us that a Lord of the Rings game could exist away from the films and stand on its own merits. The sequel, Shadow of War, released in fall of 2017 and it is better in every way. A massive open world with multiple regions, the iconic Nemesis system, and the ability to build your own Orc army are just some of the highlights. Specifically, the Nemesis system takes another step up as a means of generating unique and interesting captains for you to turn, kill, or turn into an archnemesis of your own. It's not only a great Lord of the Rings game, but it's an excellent action RPG in its own right. The Evil Within was a terrifying horror game from Shinji Mikami, the father of Resident Evil. The sequel released this year had a bigger budget, a bigger world, and a lot of great ideas to push the horror genre forward. You wouldn't think that an open world horror game would work, but The Evil Within 2 is an excellent example of how it can be done without ruining the tension or atmosphere. Uncharted has a history of always being on our list in the years it releases. The Lost Legacy is no different. This side story stars Chloe and Nadine from previous games and allows you to see the world of Uncharted from their perspectives. It's not quite as long as a standard Uncharted game, but it has the same production values and it even costs less than a standard game. If you like Uncharted, it's a simple decision. The original Nier came out with little fanfare back on the PS3, but its sequel Nier Automata made a lot of waves when it was revealed that Platinum Games would be working on it. With their expertise, we got a game with a unique and interesting story, combined with the smooth action gameplay that Platinum Game is known for. Beating the game once won't even show you half of what it has to offer. In fact, you'll need to beat it twice just to see the second half of the story! The world is like nothing you've seen, and the music is incredible. It's an RPG well worth your time. The Persona 5 release earlier this year was met with rave reviews and tons of positive feedback. It stands tall with Nier: Automata as one of the finest RPGs released in 2017. The gameplay style offers turn-based combat, dungeon crawling, and social aspects as you try to navigate the supernatural elements of the world, along with your school life. It's a winning combination! Hellblade: Senua's Sacrifice was a game with AAA production values, but was self-published by developer Ninja Theory. This made it an indie game, despite the incredible quality. In this game, you play as Senua who suffers from Psychosis. She journeys into the Norse underworld to rescue the soul of her love. This game is an emotional journey that showcases the best interpretation of mental illness in gaming. It's a milestone for not only this reason but for indie games as a whole and the things they can aspire to with the right team. It's simply amazing. Both Madden and FIFA 18 had story modes this year. These were surprisingly robust, complete with cutscenes and a fully developed tale surrounding their respective sports. With these story modes, EA Sports is finally giving us robust sports games that have all the same modes as other full-priced experiences. In either of these cases, you'll be getting one of the year's best sports titles. Our final title is one of the best games to hit PlayStation VR since the platform released. While Skyrim has been released several times, it is the virtual reality version that truly showcases the scope and scale of the game's world. It's easily one of the best titles I've played in VR, and if you haven't played it, you absolutely must. You can use teleportation or full locomotion, including PlayStation Move options. These are my top picks for this year's Christmas list, but what games do you want to see under the tree? Let us know in the comments! Have you been naughty or nice?!? What would be on your top ten list for Christmas? Post your comments below.